I was born and raised in Altoona and moved to Clarion to attend Clarion University from 2006-2009. I earned a Bachelor of Science in Mass Media Arts and Journalism, and quickly found employment as an Advertising Executive with Forever Media in Franklin. I permanently moved to Franklin in 2010 and have lived here ever since. I worked at Forever Media for just under three years before making a career leap into college admission counseling as an Assistant Director of Admissions for Clarion University based out of the Venango Campus in Oil City. Upon relocating, I became connected and would volunteer as much as possible because I believe volunteerism leads to opportunities for success as well as strong relationships. Two organizations I have enjoyed volunteering for the most are Future Leaders and Entrepreneurs Exchange (FLEX) and the Franklin Civic Operetta Association (FCOA). The success I have found in the Venango area is in great part because of these organizations. FLEX gave me first-hand leadership experience as I served as a member of committees, the organization’s president, and then events and fundraising chair. I have been part of amazing teams of young professionals organizing major events, fundraisers, and volunteer efforts, and was grateful to be named Young Professional of the Year in 2017. These are experiences I hadn’t had the opportunity to have through my career, and have been able to apply to my career and other civic engagements to bolster my work and projects I care deeply about. 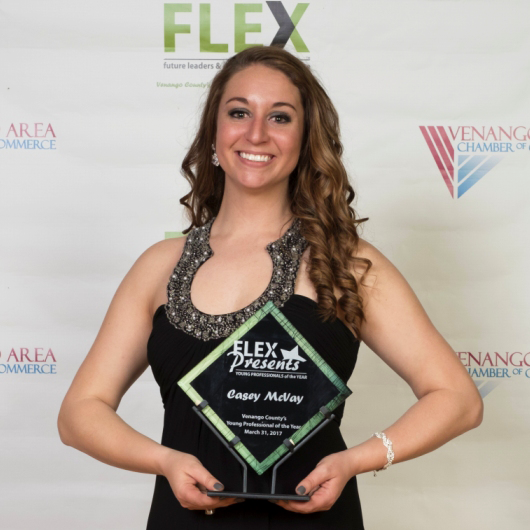 My experience with FLEX led me to serving on the Franklin Area Chamber of Commerce Board of Directors for two years, and on the FCOA Board of Directors, which I’ve been serving for three years now. I first got involved with FCOA as a volunteer performer in “Legally Blonde: The Musical” at the Barrow-Civic Theatre (BCT) and I have dedicated much of my free time to FCOA since. I am the chair of the Education Committee, overseeing the newly developed Barrow Theatre Institute, as well as chair of the Off-Barrow Productions Committee. I have also choreographed, written for, and directed multiple productions at BCT. Outside of theater and dance, I enjoy collecting key chains to hang on a US map in my home office to remind me of all the wonderful places I’ve traveled to, kayaking French Creek, and being the adviser for the Clarion University student club CU Serve (2018 Recognized Student Organization of the Year). When someone visits the area, I take them to eat at Primo Barone’s at the Franklin Regional Airport because there is nothing cooler than eating delicious Italian food while watching planes take off and arrive! Recently, I became a “mug club” member at Trails to Ales in Franklin, which is a fantastic new establishment with a beer selection that is a stellar representation of craft brewing. I love to sit there with friends, have a few drinks, and watch Liberty Street. The one thing I feel I haven’t done here is slow down, which is perfectly fine for me, but I hope to enjoy relaxing in our area more—take more walks, drink coffee IN a coffee shop and not while running OUT of one on my way somewhere else, write more, and visit my friends local small businesses more. I love that Venango County is quiet, it doesn’t take long to get anywhere, and there is always something to do. It’s easy access to places like Pittsburgh, Butler, and Erie for a change of scenery. If you’re an outdoor enthusiast, you cannot go wrong living here. When you make the Venango area your home, be ready to jump in and introduce yourself to others. Give a little of your time to the people and places here and you won’t be disappointed in the connections you make. I’ll tell anyone the same thing I was told when I arrived here—the Chamber of Commerce is a great place to start. They are some of the nicest and best informed people here! Looking back, I never imagined I would have found the success I have anywhere, but am thankful I did—and that it was in the Venango area. If you don’t mind four seasons, Venango is stunningly beautiful and the people are, too. As someone who relocated, I feel perfectly at home here.